The discovery of the papers of the Marquis de Lafayette in a fifteenth century French chateau was an event of great excitement, widely reported in the press. 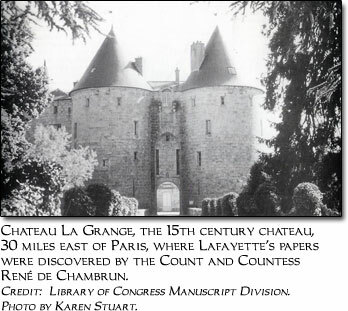 The papers were discovered in 1956 by the late Count René de Chambrun, a direct descendant of Lafayette, in the tower at Chateau La Grange, located approximately 30 miles east of Paris. The Count hired a professional archivist designated by the École des Chartes, an authoritative French historical institution, to assist him in the task of sorting, organizing and transcribing many of the important documents. According to an article in the Washington Post, September 11, 1995, the La Grange archive first attracted the attention of James Billington, Librarian of Congress, when he was researching his book, Fire in the minds of men: origins of the revolutionary faith (1980), about nineteenth century revolutions. Billington suggested high-resolution microfilm as a means of preserving the documents. After years of discussion, a contract between De Chambrun and the Library of Congress was signed and the collection was microfilmed for the Library of Congress in 1995-1996. The project was underwritten by an endowment established at the Library of Congress in 1925 by James B. Wilbur to reproduce archival sources on American history housed in foreign repositories. Cleveland State University acquired a copy of the microfilm in 1997; the donation was funded through the French/American History Endowment Library Fund, thanks to the efforts of its major benefactor, John Horton, a personal friend of Count René de Chambrun, with whom he shared an interest in French and American history. Cleveland and Washington, D.C. are the only two locations in North America, at present, where the microfilm collection may be consulted. The papers are owned by a private foundation established by Count René de Chambrun, the Josée and René de Chambrun Foundation, to administer Chateau La Grange and other family properties. The papers found at La Grange are not the whole of the Lafayette family papers. As reported in the Library of Congress Information Bulletin, it is known that many of Lafayette's papers were removed during the nineteenth century to Chavaniac, a family estate located in the Auvergne region of France, and eventually acquired by Cornell University in 1964. Count René de Chambrun was aware of the collection at Cornell, and there are references to it throughout the microfilm. The La Grange microfilm collection comprises some 6,400 feet of microfilm, on 65 individual reels; there are 50,000 sheets covering 25,000 items. However, it must be noted that the entire collection has not been filmed. The papers are a valuable source of information on American and French history of the eighteenth and early nineteenth centuries. The majority of the documents are in the French language, with much pertaining to American history in the English language. There is substantial documentation on the American Revolution, including a secret code used by Lafayette and George Washington; and Lafayette's handwritten account of the siege of Yorktown. Lafayette's many correspondents included James Monroe, John Adams, Thomas Jefferson and Patrick Henry. Lafayette's return visits to the United States following American independence are well documented, including over 100 handwritten speeches. There is a substantial amount of correspondence between Lafayette and members of his family, including letters to his wife, Adrienne, and several drafts of his memoirs. Lafayette's role as Commander of the French National Guard and his work in the French National Assembly; the era od the French Revolution; his imprisonment in Prussia and Austria, and his life following release from prison and his return to France in 1799; are also well documented. The papers have significance for the study of the French Consulate and Empire, the Restoration, and the July Revolution of 1830. Beautiful Chateau La Grange itself figures strongly in the microfilm. After 1799, Lafayette delighted in his private life, as a farmer, grandfather, and estate manager; the collection details the chateau's financial and agricultural life; its masonry, carpentry, ironwork, marble work, tapestry, and other trades; the documentation will be of great interest to social historians. A representative number of documents from the collection has been transcribed and translated for this website, and is presented along with other images. A rare item is Martha Washington's letter to Lafayette following the death of her husband in which she writes of her "irreparable loss." Also included is an early draft of the Declaration of the Rights of Man, in Lafayette's handwriting; Lafayette's account of the Battle of Yorktown, which decided the outcome of the American Revolution; examples of stationery from the era of the French Revolution; Lafayette's marriage contract; and correspondence from Lafayette's wife, Adrienne, Thomas Jefferson, and Patrick Henry. Prizewinning essays from a competition based on the Lafayette microfilm collection at Cleveland State University in 2001, are also included. Particularly noteworthy is the paper by June K. Burton, Ph.D., "Two 'Better Halves' in the Worst of Times." She concluded that Adrienne Lafayette died of lead poisoning as a result of medicine administered by her physician, and not, as historians have thought, as a result of illness suffered while sharing her husband's imprisonment. This is an excellent example of original work produced when students and researchers have access to primary source material. The microfilm is housed in Cleveland State University's Special Collections area. The Finding Aid prepared by the Library of Congress is the starting point for researchers using the collection. The Finding Aid, available on Reel #1 of the microfilm and on the Internet, is an outline, reel-by-reel, mf the contents of the microfilm. The scope notes and content notes are in English; the contents of each reel are listed in French. However, the researcher should be aware that the Finding Aid is not a complete listing of every document filmed. In addition to the Finding Aid, there is a system of Folders which the researcher will find useful, available only on the microfilm. Each reel of microfilm is sub-divided into folders, following the Count's classification system. There are introductory notes to each folder, in French, which may be quite extensive, detailing the folder contents with comments on the more significant items. Many documents have been selectively transcribed and typed, in French, with extensive commentary and annotations. French history has been more thoroughly treated than American history. It is apparent the task was left unfinished. There are notes throughout, that certain folders are "Not Filmed." Anyone needing access to material beyond what is contained in the microfilm must apply to the Josée and René de Chambrun Foundation, which owns the papers at Chateau La Grange. “The Story Behind CSU’S Lafayette Collection OR: How a French aristocrat brought two ‘Ohio Sons’ together,” by Tama Lea Engelking, Associate Professor of French at Cleveland State University, 2004. 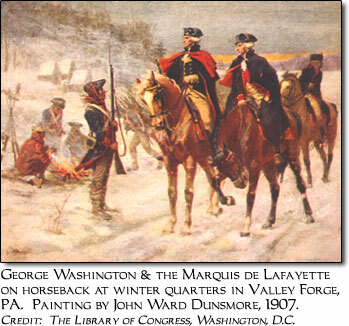 "Secrets of the American Revolution: Lafayette Papers to be Available at LC in 1996," by James Hutson. Library of Congress Information Bulletin, September 18, 1995. "Lafayette's Revolution Revelations; Library of Congress to Film Historical Papers," by Sarah Booth Conroy. Washington Post, September 11, 1995. "Museum Planned for Lafayette Papers; Archivist Already at Work on the Letters." The Historical New York Times (1857-Current file); June 19, 1956; ProQuest Historical Newspapers Online, 2004.